EVENING SATELLITE VIEW: Scattered showers and thunderstorms dot the landscape around the Findlay and Hancock County Area this Wednesday Evening. Earlier this evening, a severe thunderstorm warning was issued for east central Hancock County due to a severe thunderstorm passing east of Findlay. 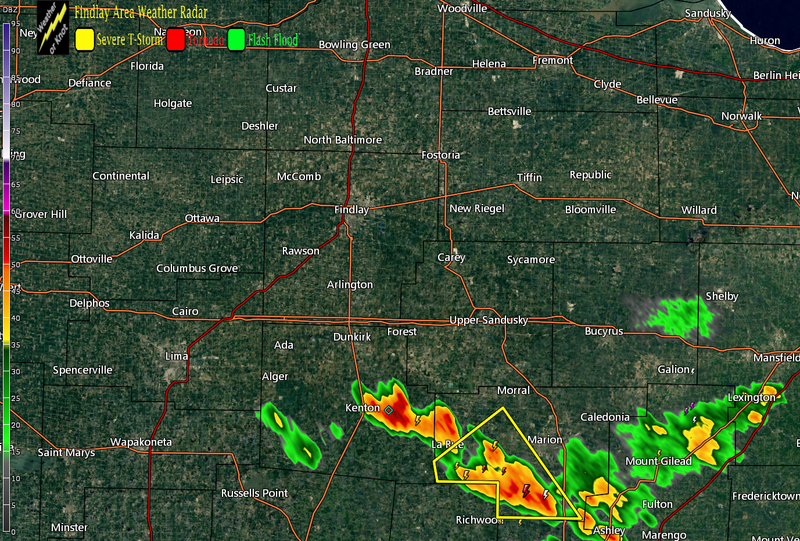 That storm has now moved southeast towards the Marion area. RADAR CHECK: The thunderstorm that prompted the earlier warning for areas east of Findlay continues to be warned down near the Marion area. These thunderstorms will begin to fade here in the next few hours as we lose the heating of the day. Most areas will be clearing out by late tonight. Some areas of fog across the city and county are possible overnight. It will be remaining warm and humid. Overnight low temperatures are forecast to drop back into the middle and upper 60s. THURSDAY AND FRIDAY: It will continue to be very warm and humid both Thursday and Friday. Just like today, the chance for scattered showers and thunderstorms will be in the forecast both Thursday and Friday. High temperatures both days are forecast to top out in the middle to upper 80s. Overnight low temperatures Thursday Night and Friday Night are forecast to only drop back into the middle and upper 60s. For those headed to the Hancock County Fair the next couple of days. most of the time there will be plentiful amounts of sunshine. It will be warm and humid. There is the possibility that you may have to dodge some scattered showers and thunderstorms. LABOR DAY WEEKEND: The Labor Day weekend looks to be plenty warm and humid. However, it looks to be a mainly dry holiday weekend. Temperatures will continue to be warm. High temperatures from Saturday through Labor Day will mainly be in the middle to upper 80s. Low temperatures Saturday Night through Monday Night are forecast to only drop back into the middle and upper 60s. While the calendar may suggest Fall is not too far around the corner, the heat and humidity look to continue. EXTENDED: Chances for scattered showers and thunderstorms will be returning to the forecast Tuesday and Wednesday. No relief from the heat and humidity is forecast during the next seven days. Temperatures are forecast to continue to remain in the middle to upper 80s during the day, along with middle and upper 60s for low temperatures. Look for the next Findlay and Hancock County Forecast Discussion to be sometime Thursday afternoon or evening. Enjoy the rest of your evening!